Hyperhidrosis is a disabling medical condition that affects the bodies’ sweating mechanism causing a severe over-reaction of the sympathetic nervous system and heavy, excessive perspiration. Currently, the medical profession does not fully understand the reasons or triggers for either type of Hyperhidrosis occurring in patients, but it affects approximately 4% of the population, or around 2.5 million people in the UK, so it is in fact more common than most people believe. 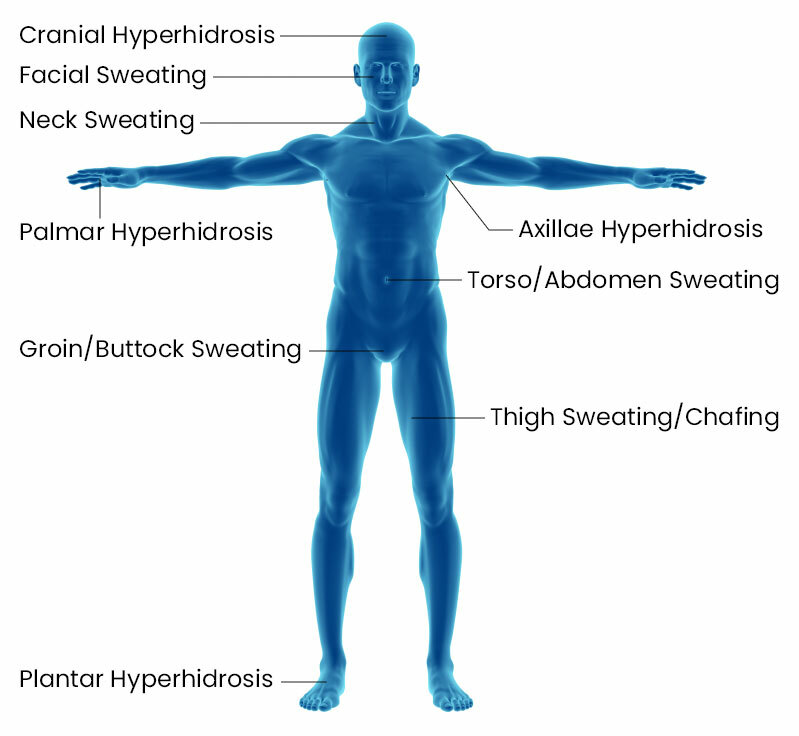 In addition to this number, many people who go undiagnosed, as sufferers of hyperhidrosis tend to go to great lengths to hide their condition rather than have it treated – but then, there is also a section of the population who suffer with problematic sweat and/or odour, but who do not necessarily have Hyperhidrosis. There are two types of Hyperhidrosis: Primary and Secondary. Primary Hyperhidrosis is defined as over-activity in the sympathetic nervous system – specifically, the Thoracic Sympathetic Ganglion Chain, which controls the release of Acetylcholine. Acetylcholine is an electrically-charged neurotransmitter produced by the body that stimulates the sweat gland, creating production of sweat. Hyperhidrosis patients experience an over-reaction of this process, which results in excess sweating. This sweating is uncontrollable and often constant and can be extremely distressing for the patient. Secondary Hyperhidrosis is no less distressing. However, instead of genetic or physiological responses, it is caused by lifestyle factors such as obesity, poor diet, menopause or anxiety. There are also certain foods (such as strong spices and herbs) and types of clothing (such as nylon and polyester) that if avoided can reduce sweating in some patients. Due to the highly visible symptoms, sufferers of Hyperhidrosis can experience serious social isolation and feel embarrassment about their condition. This is particularly so with younger teenage patients, who frankly already have enough to deal with. Although rare in pre-pubescent children, cases of Hyperhidrosis have been recorded in people as young as 5 years old. The constant wetness can also cause other skin conditions which are further aggravated by the sweating. Hyperhidrosis can affect any area of the body, but some areas are affected more commonly than others. The most common areas are hands and feet. The causes of Hyperhidrosis can vary. They can be from genetic or hereditary sources, or caused by physiological triggers (weight, diet, hormonal changes for example) or psychological conditions such as anxiety or stress. Regardless of the cause, there is very little that can cure the condition – but thankfully, there are products and treatments available that will at least control the problem. For many patients, these treatments can reduce the severity of the condition, or even stop it completely, but for others Hyperhidrosis can be a lifelong battle. When symptoms are present, the first course of action should be the use of a topical high-strength antiperspirant, such as Perspi-Guard Maximum Strength Antiperspirant Spray. There are several other products on the market with varying degrees of efficacy and suitability. Most have been created with high percentages of active ingredients – which can be abrasive to skin, and therefore unusable for many. However, Perspi-Guard Maximum Strength Antiperspirant Spray has been formulated and engineered with significantly lower levels of active ingredients, providing a clinically-proven level of protection that most users will to only require to apply once or twice per week to maintain dryness. More frequent application may be required in more extreme cases. Perspi-Guard Maximum Strength Antiperspirant Spray can be used on the underarms, hands and even the feet. It is the easiest to apply and also the least expensive and least invasive treatment option available. If you find that a high-strength antiperspirant does not control the sweating, then there are other options available. At this point you should consult your GP or Healthcare professional for further advice. They will most likely refer you to a dermatologist for alternative treatment. If sweating profusely from the face, then we recommend using Perspi-Guard Maximum Strength Wipes, using a wipe gives you the control you require to avoid close proximity to the eye area. You should check suitability of the product by performing a patch test on the area prior to use. Excessive sweating from behind the hairline is amongst the most distressing forms of the condition, especially for women. Unfortunately, there is very little in terms of treatments available as topical products cannot be applied to the scalp. However, a Dermatologist can prescribe oral medication for cranial sweating called Glycopylrollate Bromide. If you find the above non-invasive options do not work, consult your GP or Dermatologist, who will then advise you further on the range of alternative prescribed medications and other products available for you to control your Hyperhidrosis. Botox is also an effective method of treatment particularly in the underarm region, but also for the palms and the feet. There is a cost issue involved with Botox treatments and patients may require several treatments per year. Most NHS clinics do not have the budget capacity to offer Botox but there are private clinics who will offer treatment courses. Medical procedures such as ETS surgery can cure palmar hyperhidrosis, but many people are hesitant to undergo this possibly risky and serious operation, preferring instead to control the condition using non-invasive measures. A possible side effect of ETS surgery is compensatory sweating produced elsewhere on the body. For example, the surgical procedure halts sweating of the palms, but causes excessive sweating on the chest or groin or face. Your GP will be able to advise you more on this.